Are you thinking about driving from Bangalore to tourist destinations in Kerala like Kochi, Munnar, Alappuzha, Kumarakom etc? Read our driving experience from Bangalore to Kochi. We lived in Bangalore for a few years until we relocated to our hometown in Kochi in 2011. We started driving from Bangalore to Kochi due to the difficulties in getting train tickets. But eventually, we started loving this drive. Until recently, the road Coimbatore to Palakkad was really bad. But the highway construction is now completed and the entire road from Bangalore to Kochi is really good, giving a great driving experience. The highway speed limit is 80 km per hour. But most of the vehicles are driving at an average speed of 90 km per hour in the highways and I have seen some cars passing at an estimated speed of 130 km per hour. There are very few traffic signals except near the towns. If your destination is Munnar and you don't need to touch Kochi, then you have a shorter route. From Avinashi (between Salem and Coimbatore), you can take a diversion towards Palladam, Udumalpet and reach Munnar via Udumalepet - Munnar highway. This is a hilly route and if you enjoy hill driving, this is the best option. But if you are looking for a more urban driving, then come via NH-47 (Coimbatore, Palakkad, Angamaly, Perumbavoor, Kothamangalam, Munnar), which is about 120 km more distance. Bangalore to Coimbatore is the best part of the drive. Most part of the highway in this stretch is 4-lanes and you can really enjoy the drive. When you start from Bangalore, the most challenging part is exiting the city during the busy hours. Sometimes it has taken about 2 hours just to reach the Hosur area from Bangalore city. Up to electronics city, you get heavy traffic from cars and buses and once you cross the electronics city, it is the turn of the trucks. After Hosur, there is not much traffic and you can enjoy the best speed the rest of the roads. TIP: Start early morning from Bangalore so that you can pass the busy area of Bangalore to Hosur before the crowd hit the roads. We usually start about 5 am and pass Hosur by 6 or 6:30 am. Roads are usually empty during this time. 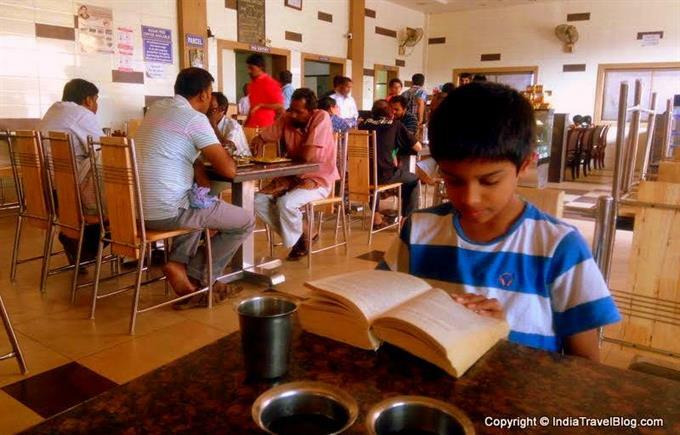 Kids usually sleep in the car until we stop for breakfast in Saravana Bhavan by about 8 am. After Coimbatore, the 4 line road changes to 2 lines and that too, without the median. This the toughest part of the road in entire route. The tool road ends before reaching Coimbatore at about 340 km from Bangalore. The divided highway ends after a while and then the roads are pretty narrow. Average speed reduces to about 50 to 60 km per hour. The divided highway starts again at 375 km and then up to Angamaly, the roads are very good. Angamaly to Kochi is more of an urban area and there are several traffic signals and small towns. You may not be able to drive above 50 km per hour in any part of this road. Metro rail construction is going on between Aluva to Kochi and traffic blocks are very common in this area. Don't be surprised if it takes more than an hour just to pass the 2 km distance from Aluva to Kochi. If your destination is Fort Kochi, you may want to skip the Ernakulam town, which is a crowded area with a lot of shopping area and metro rail construction. While coming from Bangalore, you can reach up to Edappally, then turn left at Edappally towards Alappuzha and continue in NH-47 till Kundannoor junction. Even though there are few traffic signals in this route, you can reach up to Kundannoor junction without much traffic. At Kundannoor junction, exit out of the highway and turn right towards Fort Kochi. This 14 km road is pretty narrow and busy and it may take more than 45 minutes to reach Fort Kochi from Kundannoor junction in NH-47. If your destination is Alappuzha, you come up to Edappally in the same route as Kochi. At Edappally bypass (Lulu mall), you turn towards left in NH-47 and then go continue to Alappuzha. The route from Bangalore to Kumarakom, Alappuzha and Thiruvananthapuram are common up to Cherthala. 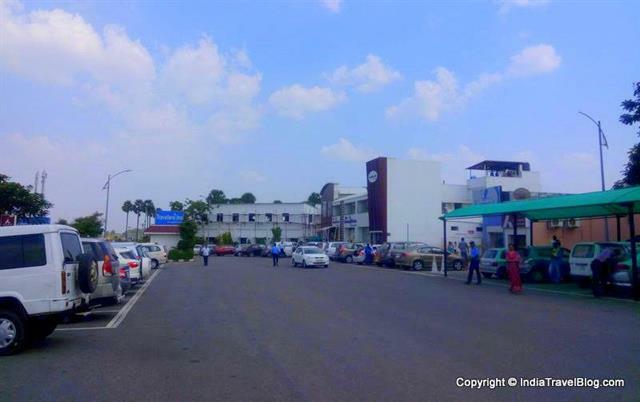 If you are going to Alappuzha or Thiruvananthapuram, continue in the NH-47. If your destination is Kumarakom, take a diversion at Cherthala towards Kumarakom. From Ernakulam, it will take about 2 hours to Kumarakom, which is a scenic drive after you take the diversion from Cherthala. 1. 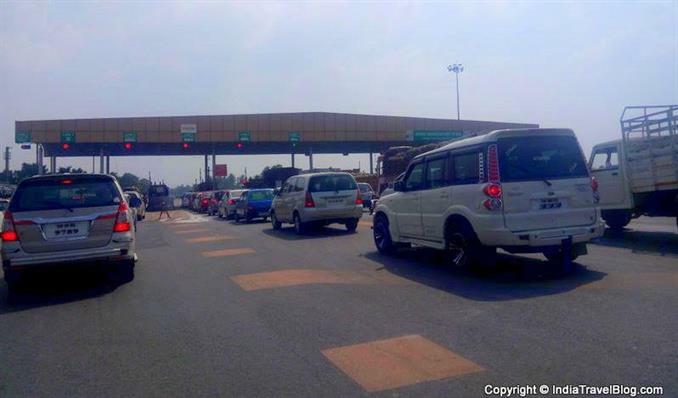 Rs 25 - this is the first toll you pay at Electronic city area while exiting Bangalore. 10. 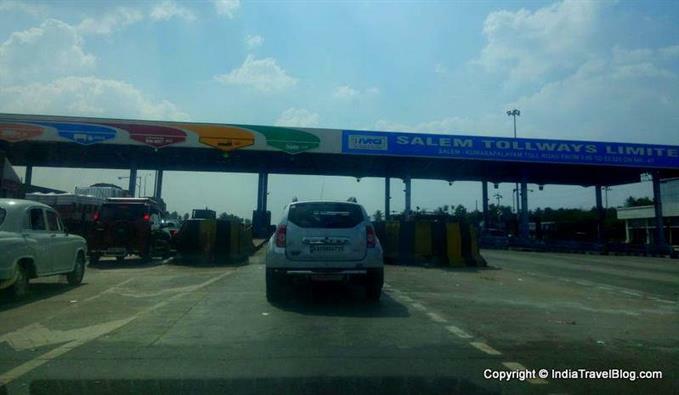 Rs 65 at 465 km - this is the last toll you pay before reaching Kochi. We are foodies and don't mind going any far for good food. One of the disappointing part of our drive from Bangalore was lack of good restaurants in the highway. However, in last 2 years, several good restaurants have come up. Looks like Adayar Anandha Bhavan is on an expansion spree and have opened multiple restaurants along the highway, along with a few new Saravana Bhavans. 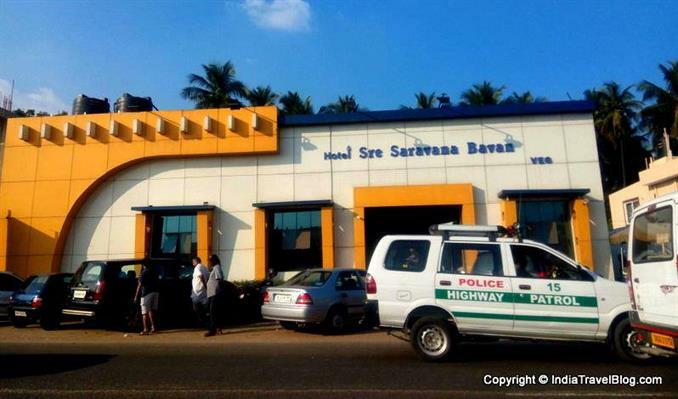 The Sree Saravana Bhavan at Vaikundam near Salem has an attached hotel (Travellers Inn) for overnight stay. As the name indicates, this is an Inn with basic facilities. They provide both 12-hour checkout and 24-hour checkout options. If the time doesn't work in your favour to complete your journey in a single day, this is a perfect place for an overnight stay in a safe and convenient place along the highway. You can have good south Indian food at the adjacent Saravana Bhavan restaurant while you relax and stay at the hotel. There is a very basic park for children adjacent to the restaurant, if you have kids with you. They have basic facilities like laundry service, travel desk, WiFi, conference room, drivers room etc. I have tried all of these vegetarian restaurants at various road trips. We usually avoid non-veg food during long drives just to keep our stomach safe during travel. Driving through GQ roads are awesome. Thanks to Vajpayee led government in the 2000's who executed Golden Quadrilateral as we see today. Today, someone from Kerela can travel to Leh or Ladakh comfortably through GQ and vice versa. The road from Bengaluru to Cochin can be shorter and save some tax if you use Sankari-Omalur-Idappady to bypass Salem. The State Highways in Tamilnadu are also better though speeds may be slightly lower. I would like to try Kochi-Kothamangalam-Kallarkutty-Rajakkad-Pooppara-Bodimettu-Dindigul-Bengaluru road next time. Although, the distances may be higher, it's fun trying new roads.